As per the Bureau of Labor Statistics, Rhode Island has the highest concentration of jobs since 9,870 CNAs were employed in May 2013. The employment per 1000 jobs was 21.63. 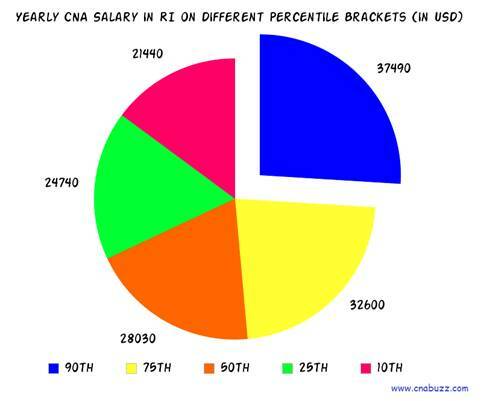 The mean yearly and hourly CNA salary in RI was $28,750 and $13.82 respectively. The income of nurse aides depends on the employer and fluctuates accordingly. The records of indeed.com state that certified nursing assistants earn an average $22,000 as of Jan, 2015. These figures were 9 percent less than the mean salaries for job postings nationwide. Geographically, RI is a small place. However, job prospects for a nursing aspirant are enormous in the state. 90% of CNAs made less than $37,490; 10% made more than $37,490. 75% of certified nurse assistants paid less than $32,600; remaining 25% were paid more than $32,600. 50% of the employees earned less than $28,030; rest 50% earned more than $28,030. 25% were salaried less than $24,740; 75% were salaried more than $24,740. 10% of employees were waged less than $21,440; 90% were waged more than $21,440. As per the figures provided by salary.com, the maximum number of cities in RI offered the median annual and monthly salary of $32,284 and $2,690 respectively. Newport offered CNAs the highest annual salary of $32,521 whereas Narragansett paid the lowest income of $32,177. Since the medical field is growing rapidly, there is an increased demand of nurse aides. The job of a CNA strengthens the foundation for a nursing career. The Bureau of Labor Statistics predicts that the escalating admissions in the nursing home facilities and the need of healthcare professionals for the elderly population will surely result into new jobs. According to the BLS, the employment rate for certified nursing assistants is expected to expand at a faster pace than the average profession, with a boost of 21 % in between 2012 and 2022. Question 1 – Is there a lot of difference in the annual salaries of CNAs in the various cities of Rhode Island? Answer – The difference in the annual salaries between the various cities of Rhode Island is very minimal. Maximum cities provide $32,284 as annual salary to the CNAs. Question 2 – Is it true that the job titles affect the salaries of CNAs in RI? Answer – Yes. 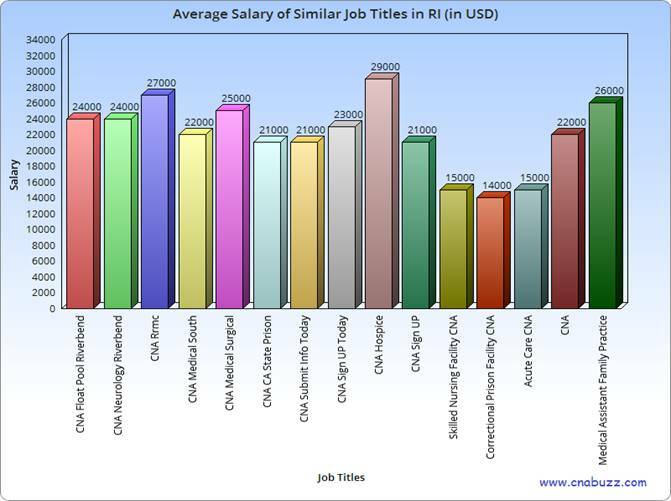 Job titles do affect the salaries of a CNA. In Rhode Island, the highest paid job title is CNA Hospice ($29,000). Other top paid job titles include CNA Rrmc ($27,000) and Medical Assistant Family Practice ($26,000).